These aren't traditionally thought of as especially rare bank notes. However, try to find an example in VF condition or better at will. It is tough to do. 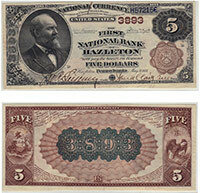 Many early banks only issued denominations of $5 and lower. Ten dollars went a long way in the 1860s and early 1870s. If you were fortunate enough to have a $10 bill then you probably spent it. That is why most examples tend to be heavily circulated. Contact us for value information. Don't forget to check the serial number. Number 1 notes always sell for nice premiums.